The first person I had a pouch for was Megan, my co-mama in the For the Love of Solids swap. 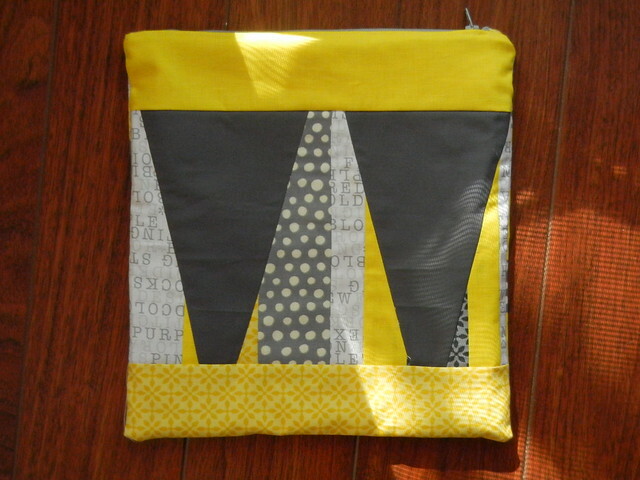 I chose to use colors to match her lovely Weekender bag, grays and yellows, and I opted to make her a large pouch to carry her hand-sewing tools. 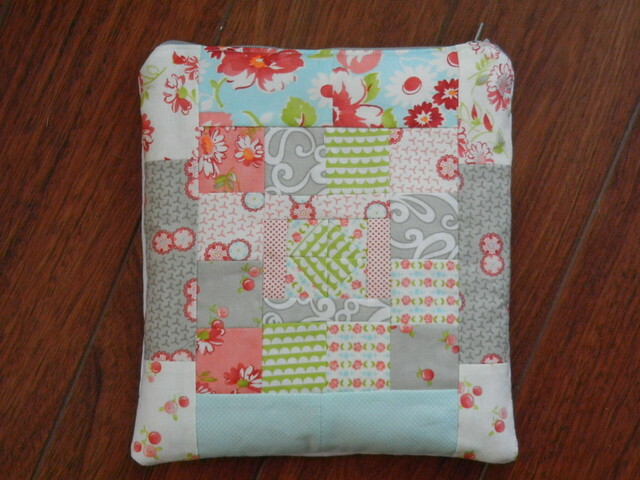 On one side, I went with a simple frame block, and embroidered it to jazz it up. On the other side, I had intended to make a kaleidoscope block, but I used the wrong template - perhaps that will teach me to label my darned templates. I decided to try to make what I did work, and I really like the end result. It's got an improv feel to it, and I think Megan's a fan, too. Lee was next up in pouch-a-palooza. It's no secret that Lee and I are great bloggy pals, but after finally meeting in person at the Sewing Summit, I'm happy to call her a good friend, too. I adore Lee's work, especially the way she uses color, and knowing she's a fan of Treasures and Tidbits, I chose to use some of the super fun, bright fabrics from that collection for her pouch. 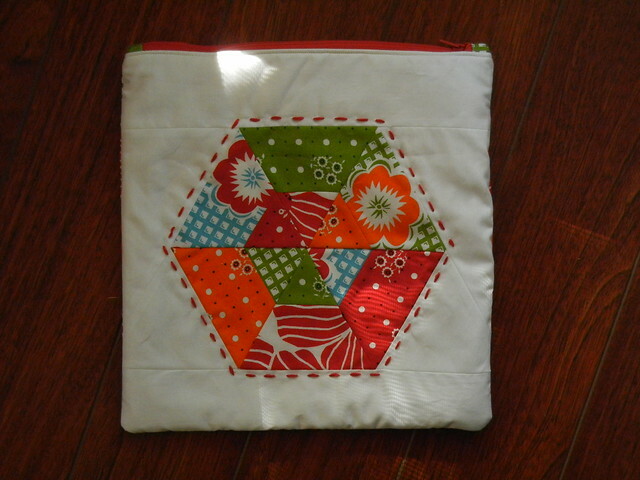 For one side, I did an x and + block, much like the one I did for my embroidery pouch a while back, but on the other side, I went with a pieced hexagon. For some reason, when I think of Lee in quilting shapes, I think of a hexagon. Why? 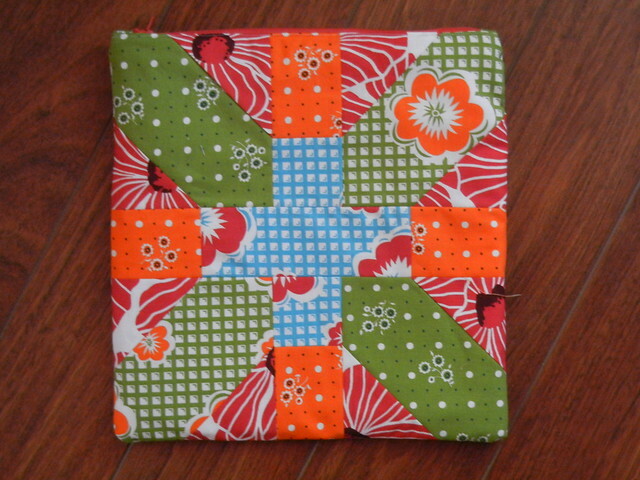 I have no idea, really, but I knew she would appreciate a pieced hexagon like this one. 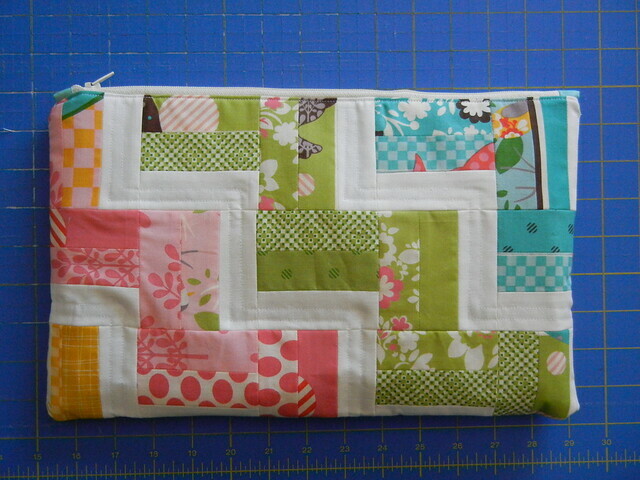 The next pouch I tackled was for AnneMarie. AnneMarie was one of my roommates at the Sewing Summit, and she was one of my earliest blog followers and supporters. I'm so glad to call her my friend. Since AnneMarie is in love with Bonnie & Camille's Ruby, and I happened to have a charm pack lying about, I decided to use that for her. I also decided to do two very different sides for her pouch - one with a super traditional shoo fly block in miniature, and the other with a more improv, modern feel. 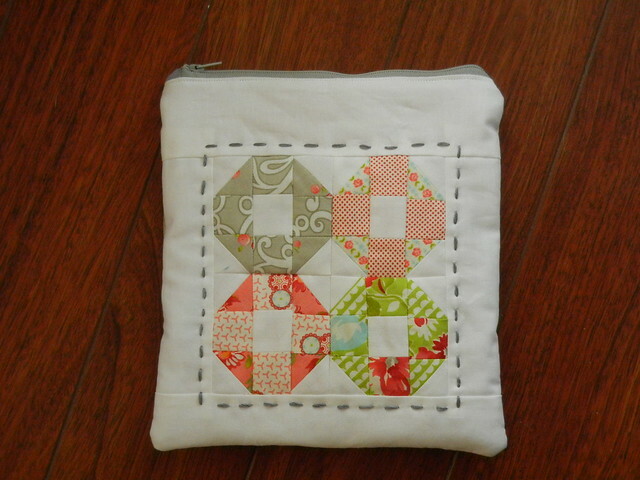 I added a little bit of hand quilting for good measure, too. 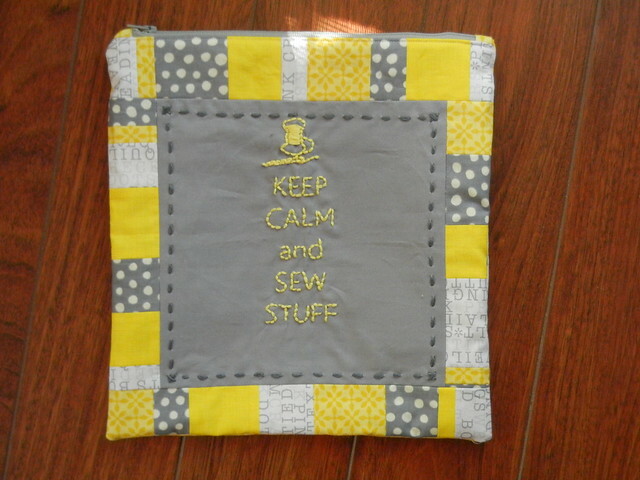 Last, but not least, of course, I made a pouch for my co-mama in the 4x5 Modern Quilt Bee, Amy. Like a zillion other people, Amy loved the rail fence quilt Rita made a while back, and I used that for my inspiration, making some mini blocks to create the stair-step effect, and using some of my prized It's a Hoot scraps. I had a hard time handing this one over, it's so darned cute.